Those that have a planner set up for the year and continue the whole way through using it. And those that chop and change throughout the year. Me? I’m the latter. I’m not a ‘change my planner monthly’ kind of person. But I’ve yet to complete a whole year in the same planner. I wouldn’t say I’ve necessarily just picked up whatever planner happens to be popular at that moment in time. I’m not a big one for following the crowd. I have yet a purchase a B6 TN for example (which everyone seems to have). My problem has been finding a planner that really works for me. 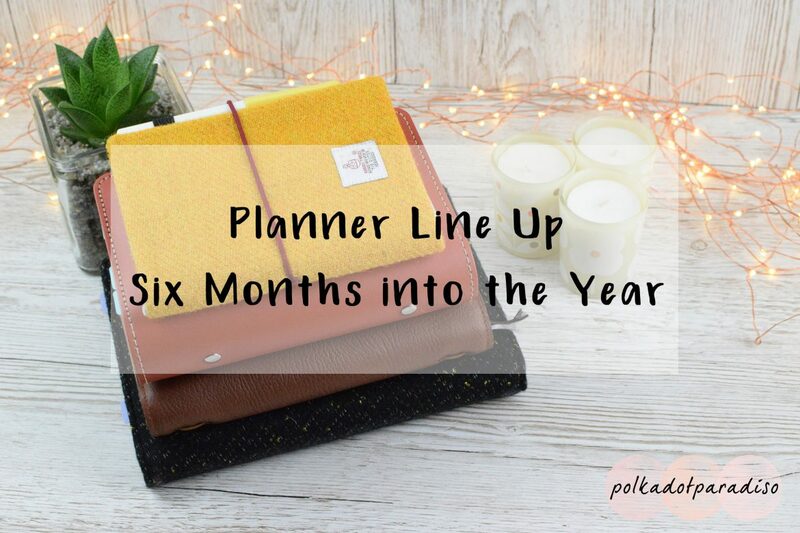 If you don’t know what I started the year with planner-wise, you can find the post from January here. I started 2018 with five planners. I’m rather ashamed to report that only one of those planners are still in use today. This was the first planner of the year to get changed. I realised quickly into 2018 that the Happy Planner was just too big for me. I also felt like I needed sticker kits to make it look pretty and that felt really rigid for me. I’d always been aware of Hobonichi planners and had been tempted by them before. Given I was on the lookout for a smaller planner that gave a little more decorative freedom it seemed like the perfect time to push the button and buy. I fell in love with the clean design, vertical planning and freedom to set up this up exactly how I needed. While the planners themselves are relatively inexpensive, the covers are not. Instead of purchasing one from Hobonichi, I picked up a cheap one from Ali Express. I really like this cover and because this planner just lives on my desk, it should survive new Hobonichi’s in the years to come. This is what I used my bullet journal for. I never really got into it for day to day planning, but it was a great place to house all my notes and ideas. Shop brainstorming session? Goes into the bujo. Packing list for a holiday? Bujo. Because the Hobonichi comes with daily pages, and I’m not really one for journaling, these all now live in there. Using a tip I picked up on You Tube, I use the yearly overview at the start of the planner as my index so I know which collection is on with date. I struggled with what to call this. This was basically everything in my Personal Fuchsia Original. It had goal planning, fitness planning, finances and things like that. I found that I was using this and my other Filofax – which was kept for shop and blog planning – less and less and so merged the two. Some of the old sections I got rid of, such as fitness planning. At that point I’d set up my fitness travelers notebook but sadly that didn’t really work out. Now I’m not tracking anything fitness but I think when I do, it’ll just in my Hobonichi. Other sections just got merged so now I have one section for the blog rather than one for post planning, one for notes and info etc. I really wanted to love the Pocket Saffiano. It was beautiful. But I just hate a planner that will not lie flat. While I liked this set up in principle, it was just an absolute faff trying to use while I was out and about. After I ordered my first Hobonichi, I followed it up with the Weeks. I loved the small size, extra note pages in the back for scribbles on the go and the fact that I could get a cover for it that would house the cards and vouchers I needed to carry that wouldn’t fit in my purse. The cover came from Cadenta Notebooks. I love the feel of this vegan leather and there’s so many pockets in the front and back that I have more than enough storage in here. This definitely used as a planner much more than I ever did the planner pages in my Pocket Saffiano. I’m enjoying using this more and because of that I’m more invested in keeping it up to date with future plans in the monthly pages. This never featured in my original planner set up post because all it was was a notebook. I was basically bullet journaling at work and it was working out pretty well. But then the notebook was nearly full and it came time to buy another. Instead of doing that, I completed the Hobonichi set and picked up an A6 and cover for it. Inspired by how much I liked the cover for my Cousin, I shunned the usual Hobonichi cover and bought a beautiful tweed one from Etsy. I figured this would work in the same way as my notebook, but with a proper monthly view for keeping track of my team’s holidays and events. This is the most a planner set up has ever changed throughout the year. While I obviously can’t know for sure, I’m pretty confident that I’m going to end the year with the same planners. The Hobonichi planners just really work for me and my style of planning and I can’t imagine a time when I won’t have at least one Filofax on the go. If you’re wanting to pick up a Hobonichi for yourself, I can’t recommend JapanEasyShopper on Etsy enough – great prices and fast shipping! Have you changed up your planners much this year? Let me know in the comments below!